Seattle is one of the most plugged-in cities in America. Given their high concentration of coffee shops, that means they have a lot of wireless internet beams flying around, encouraging random strangers to just walk up and use them. That’s one of the reasons why Seattle tops the Norton Antivirus list of the top 10 most dangerous cities for cybercrime. Using figures generated by its Symantec products, Norton compiled this list based on malware outbreaks, infected computers, zombie botnets, user habits, availability of Internet connections, and number of Wi-Fi hot spots. 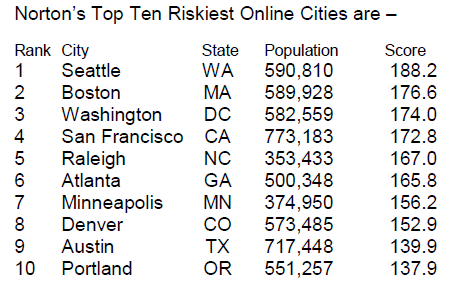 The list is kind of shocking in that you’d think a city like Seattle, with its high level of net adoption, would also have adopted proper security procedures. You’d also think that the cities on the list would be bigger! Like, I’d have assumed that New York or Los Angeles would have more virus outbreaks than Minneapolis, if only because New York’s population is several times the size of the state of Minnesota.